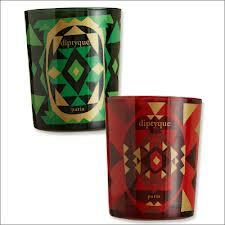 Jungle Red Writers: For the hostess! ROSEMARY HARRIS: For a while there..in my youth, it was scented candles. Then, ridiculously expensive soaps which you'd probably never buy for yourself...artfully wrapped. I still have many of them used to scent my linen closets and guest bathrooms. In the last few years olive oil has made a splash. What's the cool hostess gift this year? One year I got wine charms. I had no idea what they were. I've gotten strange liquers obviously regifted. I have nothing against regifting, particularly when it's chocolate, but I will probably have that black and white bottle of ...something...forever. The mead I got a kick out of. And the label was beautiful. And I had one friend who brought a bottle of Frangelico every time she came over. I still have a lifetime supply. Homemade anything is always appreciated. To bring or to get. I'm looking forward to my pal Helayne's rugelach this Sunday. I have two go-to recipes which travel well (recipes to come on Saturday, btw) - almond crescent cookies and struffoli - which I sometimes package, artfully, of course, and bring as gifts. But I always ask in case the hostess is planning her own special dessert. I wouldn't want to show her up - or vice versa! JAN BROGAN: Let me start by saying, that except at a Christmas party, I am philosophically opposed to hostess gifts. At one point I wanted to lead a national campaign against hostess gifts, but it seemed that if I had that much time, I really should lead a campaign against something more significant - like world hunger. At any rate, by "hostess gift" I don't mean when you bring wine or food to a party, but when you bring candles, or cocktail napkins or some cute little chochkie that I can never find when I'm shopping. The times I have felt compelled to bring a hostess gift, I've always felt embarrassed handing it over, because I'm a bad shopper and usually I'd just bought and delivered the stupidest thing in the world. And when I get a hostess gift, I want to tell whatever woman (and it is ALWAYS a woman) who bought it for me: YOU DIDN'T HAVE TO DO THIS, I MEAN IT. RHYS BOWEN: I love to get homemade gifts--anything but fruitcake, please. However I'm always so busy that I don't have time to bake. I like to take and receive plants--flowering plants in the middle of winter are great. And we always take wine. Sometimes chocolates. My strangest hostess gift recently was a swan--I'm still not sure if it's meant to hold napkins, soap...it opens its wings and is slightly scary. Regifting is dangerous. You never know who will be at which party. The only thing I do sometimes regift is wine. We drink very little red wine so if I get given too many bottles I spread the love around. HALLIE: Fish -- REALLY? Actually, we had some friends bring over fresh caught blue fish. My husband loves blue fish (me not so much) but they'd have been better if we'd been able to cook them the day they were caught. Even day-old blue fish is ... strong stuff. I'm very snooty about food (big surprise, right?) And I know they mean well, but I just hate it when someone brings over baked goods from a supermarket (even Whole Foods). Better to bring a bar of soap. (I love nice soap.) Why is it that a simple homemade cake or cookie is SO MUCH BETTER than anything you can get in the store? When in doubt, bring wine! HANK PHILLIPPI RYAN: Yes, I LOVE getting wine! And I always bring it! (In fact, sometimes I bring two bottles..Jonathan says--we don't need TWO.) Getting? Soap. I love little soaps although I can never bring myself to use them. It's thoughtful when people bring food, but I never eat it. And are scented candles passe? Not for me. DEBORAH CROMBIE: Oh, erg. I'm terrible at hostess gifts. I'm a "stop at the supermarket, grab a bottle of wine" kind of guest. Although I love it when friends bring pot-luck-y things like yummy appetizers, or I have a friend who makes the best brownies and pound cake--things that never come out of MY kitchen! Fish?? Really? Though I wouldn't turn my nose up at some nice smoked salmon. If I'm the one gifting, I'll remember the cocktail napkins. They're ridiculously expensive, and something that always (unless you happen to be a bachelor type) comes in handy. Interestingly, the rules of dinner party etiquette seem to be more formal in the UK. One would never ever dare show up at a party without something in hand, and wine AND chocolate AND flowers are not overboard. ROSEMARY: What will you be bringing, making or hoping to get? I’m with Hallie on the “no baked stuff from the supermarket” . . . .
Homemade bread is often my “go-to” hostess gift, especially at Easter time when I make Easter Egg Bread. Homemade cookies at Christmas time . . . chocolate fudge made from my mom’s recipe . 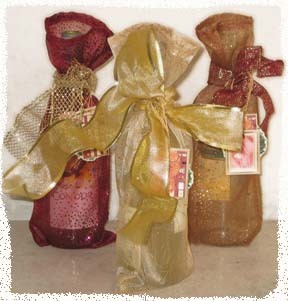 . . and wine is always good . . . .
It’s harder if it’s a non-food hostess gift . . . then I’m most likely to stick to candles or flowers . . . plants are good if you know the hostess enjoys them; otherwise you’re pretty much consigning them to some sort of neglectful demise . . . . I love love love when people show up at our house with anything they made. Baked, cooked, sewn - whatever. And I like to show up at other people's houses with mini-bundt cakes. Or my newest favorite candy I'm making this year - white chocolate bark with crushed lemon pieces. For our last Halloween party, I served a cocktail made from chocolate wine and Fra Angelico. It was similar to Bailey's. Jan, come and stay with me, and bring one (or two) of those bayberry candles, please. Love that particular scent, which is really hard to find these days. Someone gave me the ugliest dish towels as a hostess gift, and I made the mistake of washing them. They would have made a dandy regift item, durn it! We usually just take wine, unless it's in the last couple of months of the year. Then we take calendars with photos of birds that my husband and his brother (and their dad before them) sell to the calendar company, for the last 45 or 50 years. It's a very popular gift. For writer friends especially, I sometimes bring a book I just read and liked, and right now I'd present a copy of GONE GIRL by Gillian Flynn. Just read it this week on the beach. Wow! I agree that sometimes a hostess (or host) gift is just unnecessary. It is nice, but I really didn't invite you to my party so you could bring me something. Just being there is gift enough for me. That said, I know people like to bring stuff, and I feel like I should as well. So, wine is always good. And I agree that homemade is always better than store bought. But I really think that people should realize that the host (in my case) won't criticize you if you just show up empty-handed. On Saturday, I am having a cookie party (not really an exchange, just a party with lots of cookies). I do ask that everyone bring one dozen cookies, but STILL they feel the need to bring other stuff. With 50 people at this party, that can be tons of "stuff" that I don't really need or have a place for. But it is the gesture that counts, so I understand the need. How about just giving me a hug! Whoa, did you see the meteors! We saw..maybe six, but we were so excited! Cocktail napkins! Terrific idea! Do you think everyone would agree? I guesss--what's not to like, especially if they are timely. And people who bring flowers--make sure they are IN someting. SO the hostess doesn't have to stop everything and arrange them. Right? They also have coasters, and magnets, and several other cool products with the same cheeky sayings and photos. I saw more than a dozen meteors last night, very cool! A friend said she saw one at 7 this morning, while waiting for the bus with her daughter. Yes, please bring flowers already in a vase, if that's what you choose to bring. What a pain it is to stop everything and rummage around, etc. Years ago, you used to be able to get fabulous sets of cocktail napkins from the shop at the Metpropolitan Museum of Art. Sadly, no longer. But I did find these fun napkins for my New York friends, or anyone who just wants to be reminded of NY. I love to give (and get!) wine or champagne during the holidays. I like to give but not get cookies, because cookie nibbling is one slippery December slope that leaves me full of January regret. This weekend is our ritual cookie baking weekend. We whittled the list to five varieties this year: Russian tea cakes, lemon squares, spritz cookies, chocolate dipped macaroons and my personal favorite, chocolate with peppermint). The goal is to give them all away. Quickly. P.S. Roberta, fish? Really? As a hostess gift? Was the giver my brother? 2 16 oz of good cheddar cheese soft spread. Have a good hand or stand preferred electric mixer. With wisk attachment whip till the consistency of mouse. 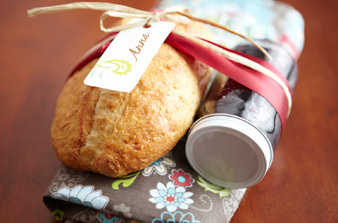 Pack in jars or crocks....after chilling for a few hours, tie with ribbon, and I add a recipe card with it. Enjoy with good crackers. EXACTLY. That was the crux of the nationwide campaign against hostess gifts that I never launched. I like that recipe, but where do you get the little crocks?? Mmmm, baklava for me please!! You all are surprising me by liking when a guest shows up with food -- I've always steered away from that, unless it's something wrapped that can be tucked away for themselves later, like jam or chocolates, b/c I didn't want to mess up their menu, or force them to find a spot on the buffet for my fabulous whatever. Maybe I'll loosen up! I saw 17 shooting stars between 2:15 and 3:15 and called it a night. I hated thinking there would be more without me. I was bundled up in the double sleeping bag we used in Nepal! When I know the hostess very well, and the hostess is a Christmas tree person, I like to bring a Christmas ornament. Like the cocktail napkin idea, too! Many years ago, when I was very, very young, we had two good friends, an "older" couple, over for dinner. They brought fresh picked grapes from their backyard vine and a food new to our community, string cheese. If it weren't for their hostess gifts we wouldn't have had anything to eat. I still don't know what I did wrong, but after cooking the chicken for three and half hours, it was too tough to cut with a knife. I think I forgot to start the vegetables, because they were cold on top of the stove. We had a loaf of crusty bread, though, and a bottle of wine. Our understanding friends kindly gathered it all up and carried it out to the back patio where we had a sort of picnic. I tried not to cry. The four of us are still good friends. Reine, that actually sounds like a pretty darn good meal: A loaf of bread, a jug of wine, and thou. Plus grapes and cheese! Perfect. Karen, I was thinking the same thing! We are so poetically inclined. You and I. When not off on a tare. ... getting the boot from bloggers more delicate than one might suspect. My view on bringing food as a hostess gift if it's a good-sized cocktail party: the hostess is already going to have to deal with so many leftovers. Don't make it worse. Wine is good. Tonight I took a bottle of dipping oil. Thought it was a great idea.